analogous; consequences; can; (to) have; error; In The direction; reached / achieved; rocket; of the speed. centre (which I haven't figured out yet). And there is the hiding of His power." 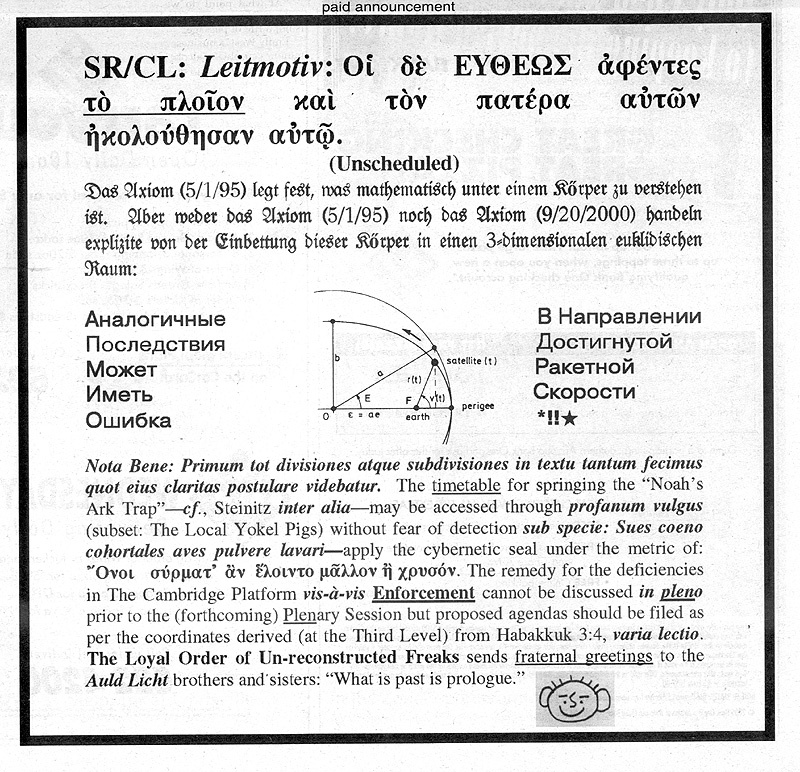 the axiom (9/20/2000) act explicit of the imbedding of these bodies into a 3 dimensional Euclidean area." are of a similar nature to some encountered in that document. Note, the letters "plen" are underlined in both "pleno"
and "plenary" for some reason. past is prologue" a quote which occurs elsewhere in the announcements (IIRC may have been a previous 'leitmotiv'). Perigee - When a satellite follows a non-circular orbit around the earth, the satellite's path is an ellipse with the center of the earth at one focus. Such a satellite has variable altitude and variable orbital speed. The point of lowest altitude is called perigee. Habakkuk 3:4 - And his brightness was as the light; he had horns coming out of his hand: and there was the hiding of his power. The only Auld Licht I can find is by J M Barrie. Not read it, but chapter 4 is titled 'Lads and Lasses', which could be 'brothers and sisters'? 'What is past is prologue' is a Shakespeare quotation but seems to be well used. Noah's Ark Trap is an album by Nic Jones, but is also (and probably more relevantly) a chess move/sequence. I think this is the original but there are apparently variants.. Not sure whether this (or any of the variants) match any chess diagrams we've seen previously? a6 4 Ba4 Nf6 5 0-0 d6 6 d4 b5 7 Bb3 Nxd4 8 Nxd4 exd4 9 Qxd4 c5 and Black traps the White bishop on the next move. An Auld Licht is a member of the conservative party in the Church of Scotland in the latter part of the 18th century. Habakkuk 3:4 in the NIV version is "God came from Teman, the Holy One from Mount Paran. The only part that I could dig out was the obvious connection between the English and the Latin in "plenary." When you also see reference to "cybernetic" I wonder if the underlined portions don't refer to some kind of key. capitalised word is 'straightway' and the underlined bit is 'the ship'. Greek following 'under the metric of' is from the Fragments of Heraclitus: "Asses would rather have straw than gold"
Latin following 'sub-specie' is also from the Fragments of Heraclitus: "Swine wash in the mire and doves in the dust"
astronomical coordinates. It seems to figure very largely in connection with maps. "What is past is prologue", while probably unimportant, is quoted on a statue in front of the national archives building. around the diagram I would say that there is some activities centering on Russia. either be useless or I won't remember which advert referred to it! Basically, 'mistake' is the subject of the sentence, and "arrival" is probably a better translation. nor the axiom (9/20/2000) deal explicitly from the embedding of this body in a 3-dimensional euclidean space." appeared in the paper on those days, however I am unsure which axioms it is referring to. being used to suppress deviation from doctrine.